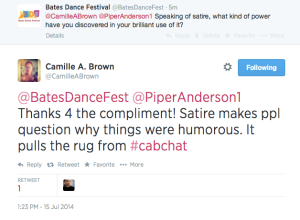 Today, the Bates Dance Festival participated in a live twitter chat with Camille A. 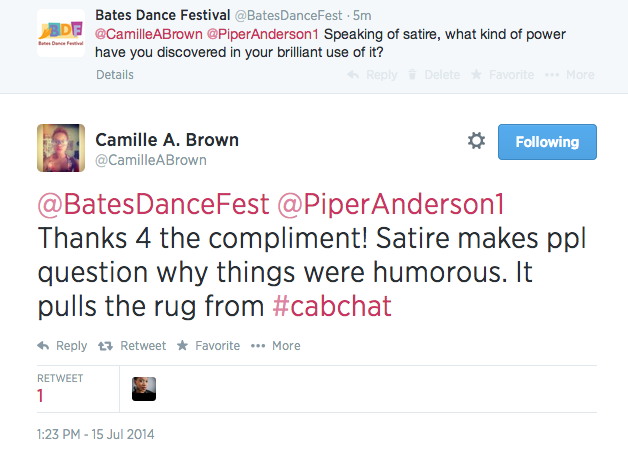 Brown, which was hosted by Piper Anderson. Lincoln Center’s Bill Bragin and 651 Arts were a couple of the dialogue’s participants. The brilliant conversation surrounding arts, activism, dance, theater, and dialogue unfolded under the hashtag: #CABchat. Don’t forget to check out tonight’s Show & Tell!